Posted June 28, 2006 in 2 Fox, 2006/06, Periods, Serial Posts, z Archive. Stan Taylor has sent me some scans of panels from Flash Gordon done by Alex Raymond. Four of these have figures that so closely match work by Joe Simon as to leave no doubt that they were used as sources for swiping. I include one here because it is such a good example of Joe’s working method. 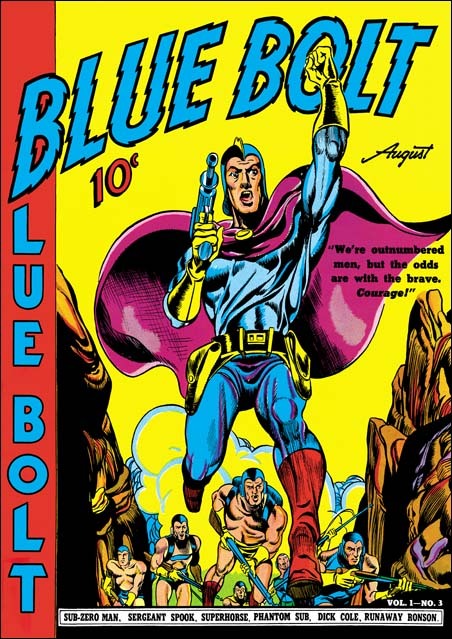 For the cover of Blue Bolt #3 Joe made significant changes but we shall see later that he used this same figure again this time with only a little modification. Please excuse the odd coloring on this image. Stan remarked to me about the similarity of the holster but his scan was a little dark for me to see it. So I did some Photoshop adjustments to make it clearer. But these adjustments brought out artifacts of the jpeg compression used. The original does not have all the odd rectangular color areas. Posted June 25, 2006 in 2 Fox, 2006/06, Periods, Serial Posts, z Archive. Most of the work that Joe Simon penciled having cover dates from May to July of 1940 were the Fox covers discussed in the last chapter. But Joe was still a freelance artists and he did some work for other publishers. 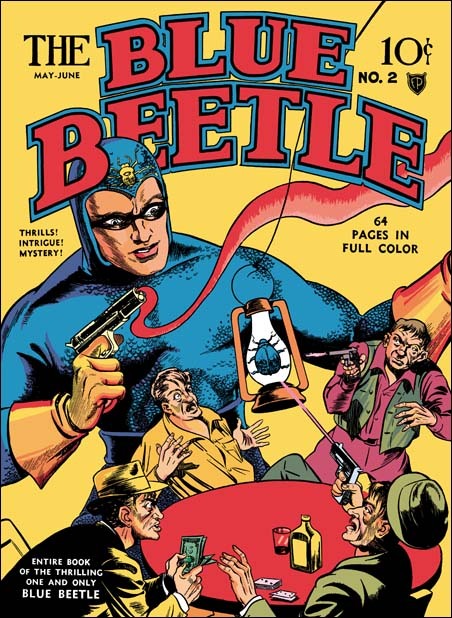 For Novelty Press, the same publisher as Target Comics, Joe created the titled feature of a new comic, Blue Bolt. For this Simon returned to the science fiction genre, but adds a superhero to the mix. Even though this story was done at the same time as the Fox covers, Joe does not try to imitate Lou Fine here. Nor is there any reason that he should since Fine never did any work for Novelty. However the work that Joe did on the Fox covers seemed to have some affect on his style, his lines seem lighter. 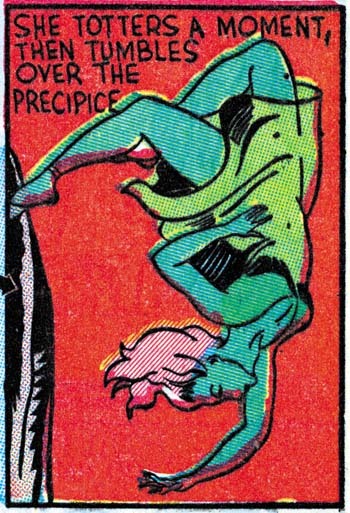 The previous damsel in distress now reappears as the falling Green Sorceress. 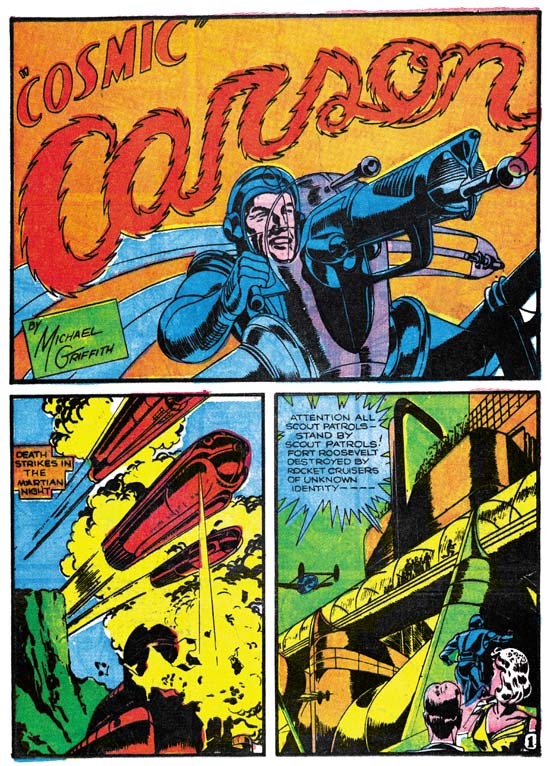 Either he is copying from Silver Streak #2 cover, or I was wrong and this form was not an altered version of the appearance in the Phantom Bullet and the cover of Wonderworld #13 but instead there is another source for the swipe. Either way Joe is still using swipes. 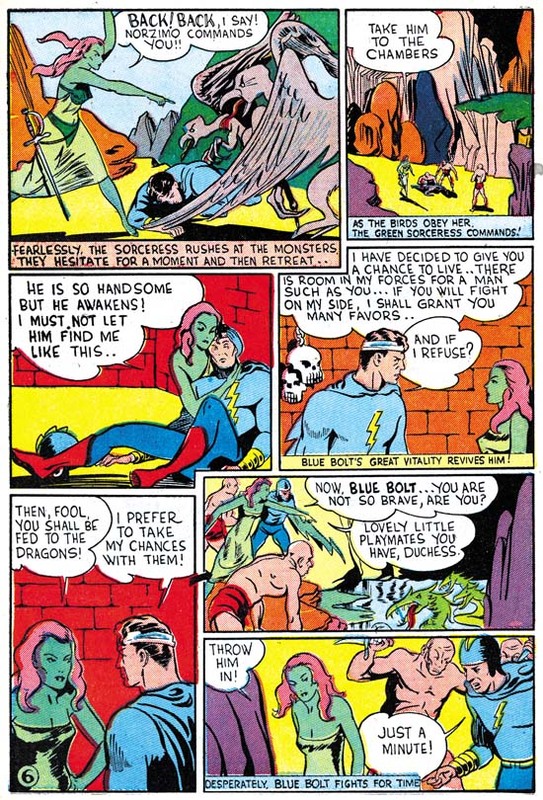 Jack Kirby joined Joe on work for Blue Bolt after the first issue, I’ll be discussing that in the next chapter. This seems the best place to present the cover for Blue Bolt #3. 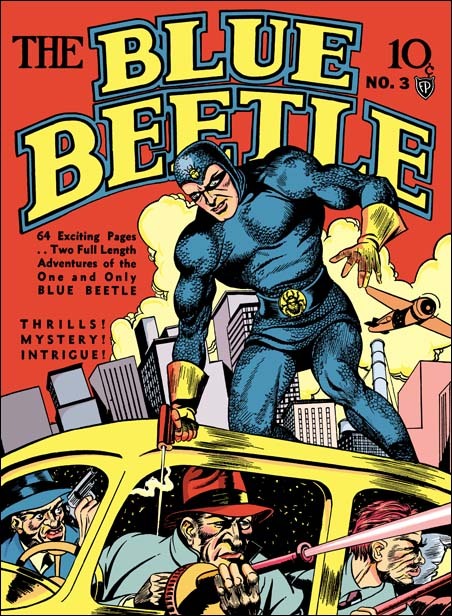 Despite the appearance of the Blue Bolt character on the covers to #1 and #2, issue #3 is the first time Joe would provide the art for the cover. You can tell it is by Joe by the way the eyes are done, particularly in the smaller soldiers. Also the rock formations are similar to the ones Joe did for page 2 of Blue Bolt #1 (see above). As we seen before Simon likes to emphasize the importance of the hero by enlarging him. In this case he does this by using a low view point so that perspective provides the results he wants without looking unnatural. 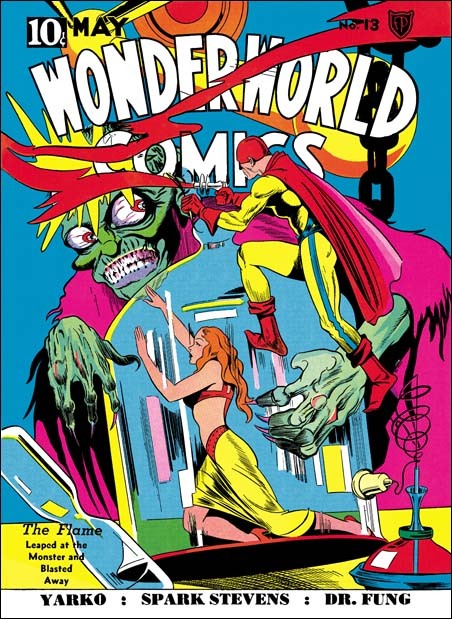 The cover is a close copy of a panel from the story. Greg Theakston (The Complete Jack Kirby, 1917 – 1940) has attributed that page to Jack Kirby, but I do not believe he is correct. I will include a scan of the page in my next chapter. Maybe by the time I write up that post I will have changed my mind. 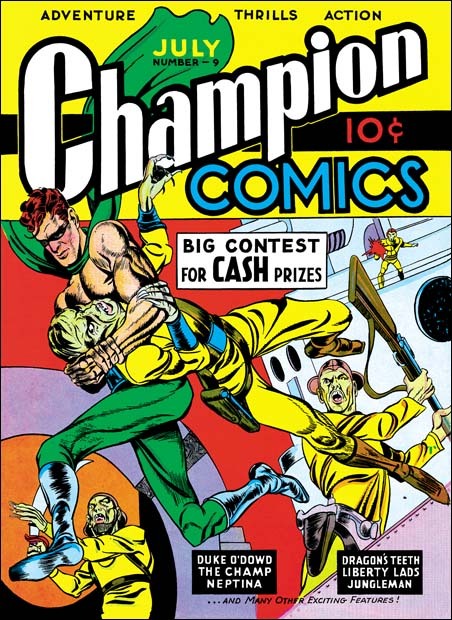 The Champion Comics title was published by Irving Manheimer. Manheimer was the president of Publisher Distributing and as the name says it was a distribution company. Printers wanted to keep their presses busy so Irving also acted as a comic publisher. That helped to keep the printers active, gave PD more items to distribute, and provided Irving some profits from the comics themselves. 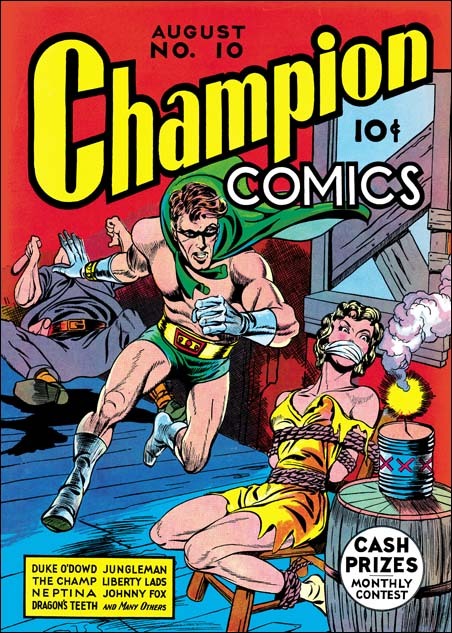 Joe Simon drew the cover for one of Manheimer’s title, Champion Comics #8 (June 1940). Again although Joe made no attempt to mimic Lou Fine, this cover is very different from his previous ones. Inking is finer then Joe’s earlier covers but not nearly as fine as the Fox covers he was doing. Joe uses the brush more often with bolder markings. He also is more concerned with defining forms then before. Forms are suggested by rows of close or touching brush stokes, kind of like the reverse of a highlight. One new inking technique appears on the bottom of the background buildings. Small areas are covered by parallel lines. Nearby areas have similar lines but at a different angle. This provides a similar tone to the entire area while giving it a mottled looked. This technique appears on a few covers that Joe is associated with over the next year or so and then disappears and does not become part of the S&K shop inking. 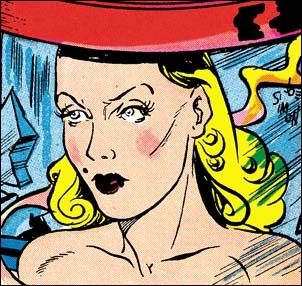 A similar inking was used on some of Al Avison’s work where it appears for a longer time. Did Al learned it from Joe and later Joe abandoned it? Or was this an Avison trait that indicates Al inked this cover? I lean toward the former explanation because the inking of this cover is pretty good. 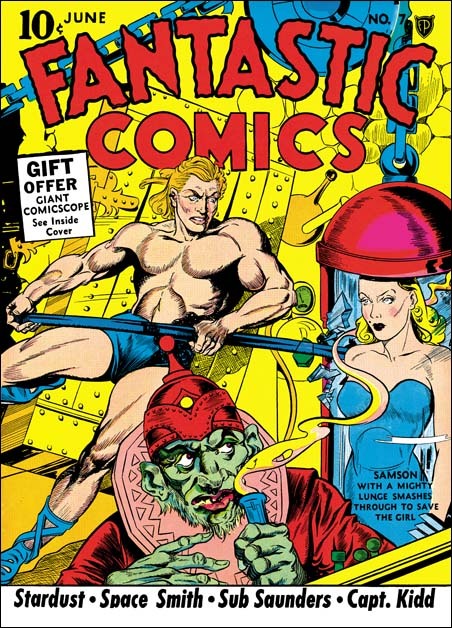 The Fox covers show that Simon had become an accomplished inker while the earliest efforts I have seen by Avison, done even later then this cover, are not all that impressive. In the last chapter I stated I felt that the Fox covers did not show any Kirby influence. On the other hand I feel Champion #8 does. For the first time on a Simon cover we find a hero’s punch being portrayed. The villain that received this hit is shown falling backwards. This type of action scene would become a Kirby trademark. The only problem with my suggestion is that I am not aware of Jack having drawn this sort of action up to the time this cover was made. 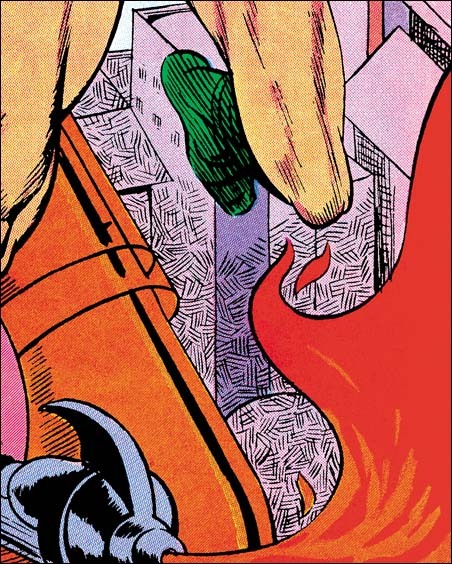 Another Kirby-like feature is the futuristic ray gun that Joe has drawn. Just the last month Jack included a similar weapon in “Cosmic Carson”. Some have called Joe’s version a swipe, but I find it so done so differently that I feel Jack’s gun was more a source of inspiration then an actual swipe. When I first showed Joe my restorations of the covers for Champion #8 to #10, he said that he had not yet met Kirby and that he had done all of these covers. 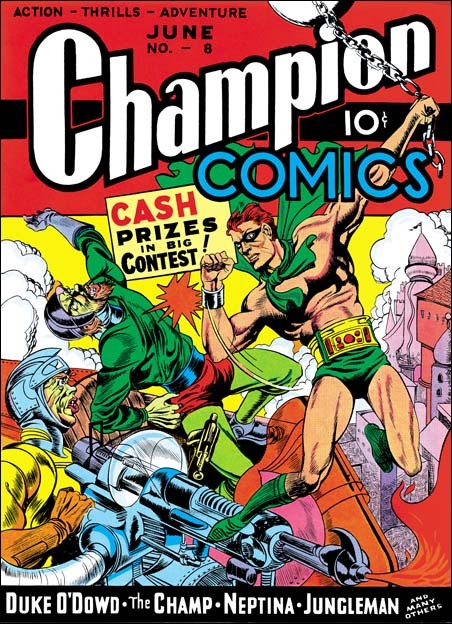 Carmine Infantino looked at Champion #10 and said that surely Jack had done it. When Joe looked again he agreed, but insisted that he (Joe) had done the other two. The hero’s more square face in Champion #9 does seems much closer to that depicted in #8 then that of #10. But the scene has more action then anything Joe had done before. Also as Greg Theakston has pointed out (The Complete Jack Kirby, 1917 – 1940) the hero is shown running with the sole of his foot turned toward the viewer. This is something Jack has already done in the Blue Beetle strip but has not yet shown up in any of Joe’s work to date. Because of these two facts I have to respectively disagree with Joe and attribute primary pencils of this cover to Kirby. The inking of the cover is a good match to the work done on Champion #8. It even has an area with the mottled type of inking in a strip in the purple arch. The portal in the upper right is inked in the way Joe had picked up from Lou Fine leaving small irregular uninked areas. I therefore feel, as others have proposed, that this is the earliest Simon and Kirby work. Although previously I have made some comments about Joe Simon’s inking it was for art that I feel we can be pretty confident that Joe was doing his own inking. This series is really about Joe as a penciler. So why am I including a cover drawn by Jack Kirby? Well I believe it is important from time to time to show what Jack was doing as a comparison. Part of what this serial post is about is distinguishing Joe’s work from Jack. Besides which I do not think anyone is going to object showing some Kirby work, after all this is the Simon AND Kirby blog. 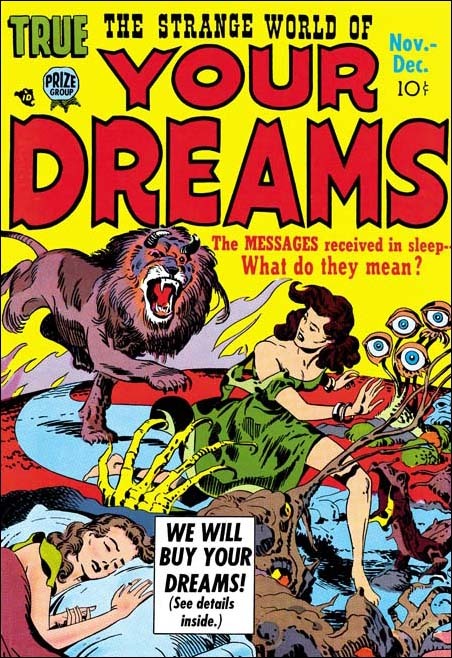 In my next chapter I will examine other work Joe Simon did in his newly formed partnership with Jack Kirby. Posted June 20, 2006 in 2006/06, 4 DC (early), Harvey Covers, Periods, Topic, z Archive. The pointing hand of the clown looks like it was done by Kirby. But only that small detail does. 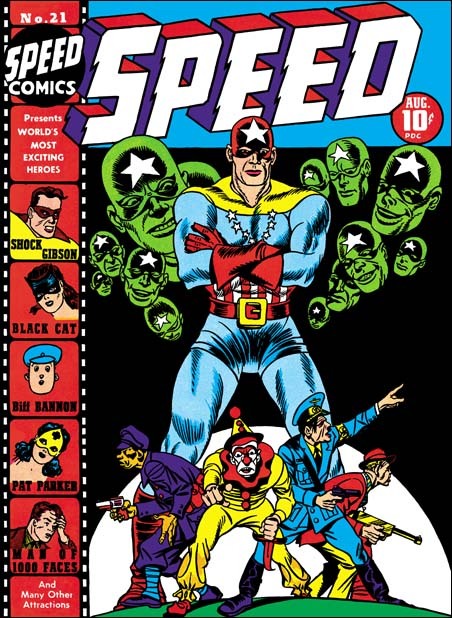 The Japanese, the clown, Hitler and the gangster in a small circle cluelessly looking for Captain Freedom is just the sort of visual humor I come to expect from Joe Simon. And Captain Freedom towering over them, as well as all his floating heads, seem to me to have been done by Joe’s hand. So I make Simon as the primary penciler. It is wonderful to see all the different approaches to a cover S&K did for Harvey. But actually that was true with S&K during all their collaboration. They always seem to put great effort to make their covers stand out from the rest of the crowd on the racks. Posted June 18, 2006 in 1 Early, 2006/06, Periods, Serial Posts, z Archive. 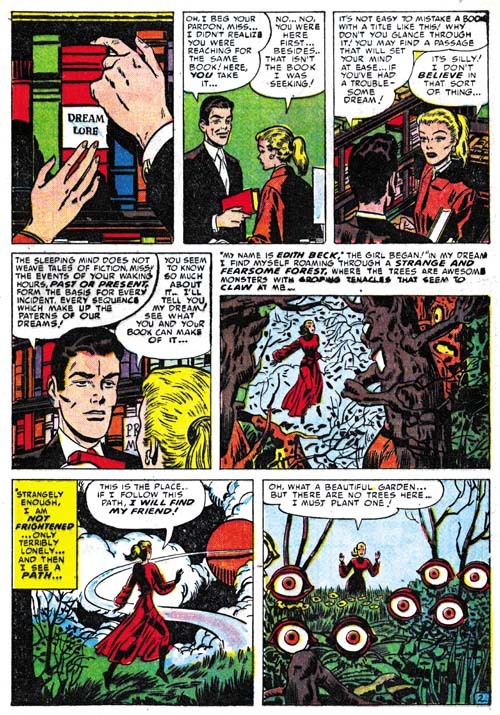 During a visit I gave Joe Simon copies of my restoration of the two stories in Daring Mystery #2. He had completely forgotten about both of them. Before he had begun to look at them I mentioned that he had signed one of them using a different name. Joe stopped and said “I bet you I know what name I used, Gregory G. Sykes”. Boy was I surprised, if he couldn’t remember the stories how could he remember the pseudonym? Sure he added a middle initial, but otherwise he got it right. Joe explained that in that in high school he and his friends sometimes used another name, his was Gregory G. Sykes. He especially could not get over the ice bullets from the Phantom Bullets. As for Turjak Joe coyly wondered where he got that idea from. I went along with it and pointed out the subtitle “King of the Jungle”. Joe chuckled and admitted that as a kid he often went to the library to read Tarzan and had been a big fan. Posted June 16, 2006 in 1 Early, 2006/06, Periods, Serial Posts, z Archive. 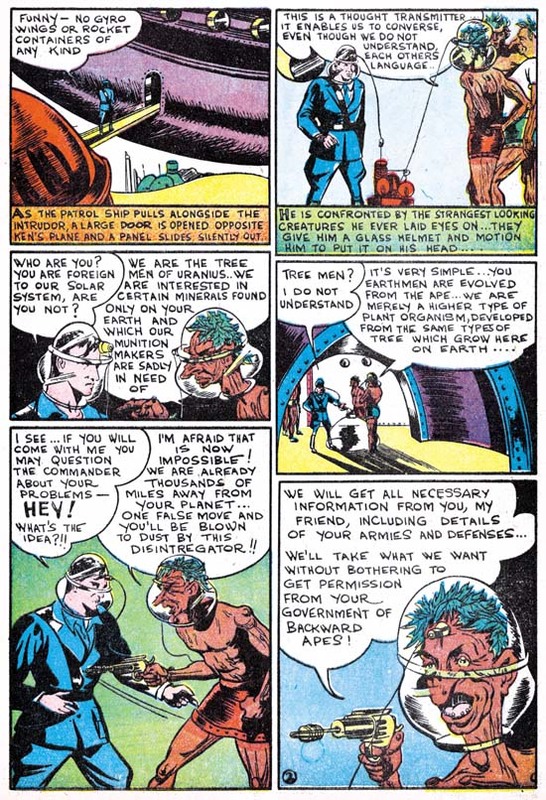 The GCD lists Joe Simon as the artist for Solar Patrol in Silver Steak #3 (February 1940) and renamed as Planet Patrol in SS #4 (March 1940). I have not seen either so I cannot verify this attribution. Still the timing and Joe’s frequent signing of his work makes it likely to be correct. 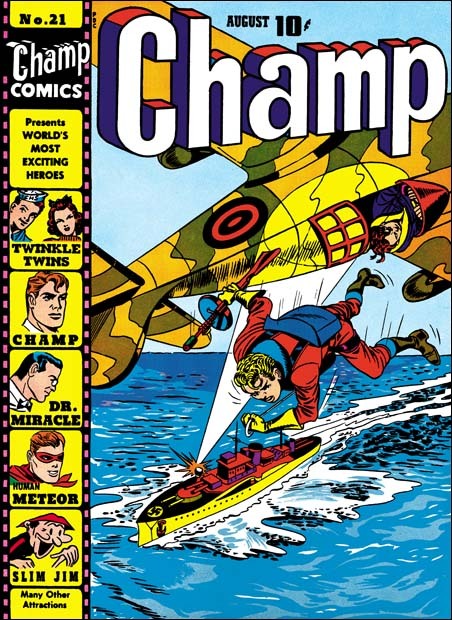 In February titles we also find Joe Simon starting a feature in Target Comics #1 (Novelty Press) called T-Men. He does a similar job to the one he did in the tree man story for Solar Patrol. One important difference is that although he still does not use the standard panel layout, his deviation from a strict grid are small and there is never any question about the proper reading sequence. The story is a little better then the Solar Patrol one, but it is without the improvements shown in his Fiery Mask story for Timely. This may be just Joe still trying to adjust to a new art media. However I suspect that the T-Man story may have actually been done at about the same time as Solar Patrol but the publication of it was delayed. This is the first part of a two part story. But the way the first part ends leads me to wonder whether if it was originally meant to be two parts. The ending seems abrupt and not like a planned cliffhanger. When the story continues in the next issue it is quickly wrapped up in a few panels. My suspicion is that the story was originally eight pages. Either this is not the length the publisher asked for, or a length change was required later. In either case Joe did a little fixing to make it a seven page story with a “to be continued”. But when Joe returned to the story for the next issue he knew he wanted to have a half page splash and he wanted to proceed with the new story line. So he cut panels from the former eight page and pasted on the new page. If I am correct this is the earliest example of Joe using cut and paste as an editorial method, a technique that he would use throughout the rest of his career. 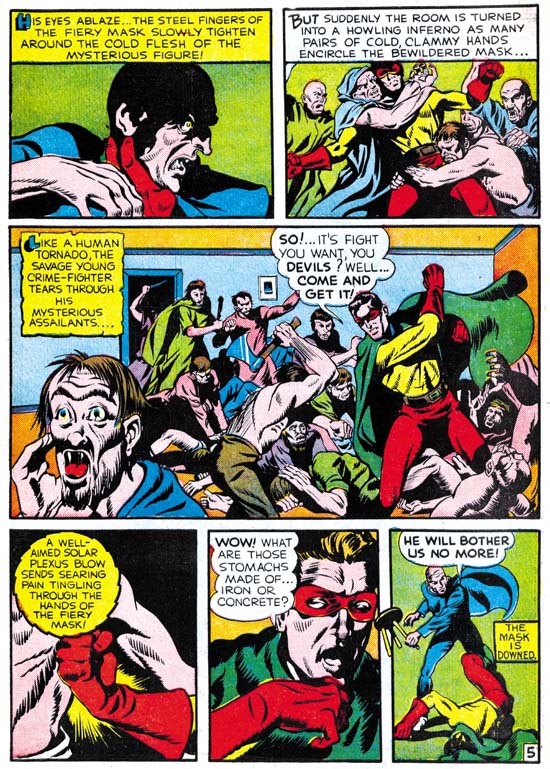 The Fiery Mask did not reappear in the second issue of Daring Mystery. Instead Joe launched two new features. The first was Phantom Bullet. The hero has a gun that shots ice bullets. The idea being that after the ice bullet has done its work it melts, leaving the police without a clue. This was a hero? Although Joe still has a way to go, he has made progress in his comic artistry. Like last month’s Fiery Mask, this one has a pretty good story and the art work shows improvement. But Simon is still doing simplified drawing and his trademark angled eye/eyebrow remain. But his style seems consistent throughout the story. You might think that this was an indication that Joe did not do any swiping here, but you would be wrong. Take the kidnapped lady in panel 8 of page 9, rotate her until she is upside down, take a mirror image, and move her arms a bit and presto change-o she becomes the damsel in distress from the cover of Silver Streak #2. I said you would see her again. Guess what, Joe is still not finished with her. 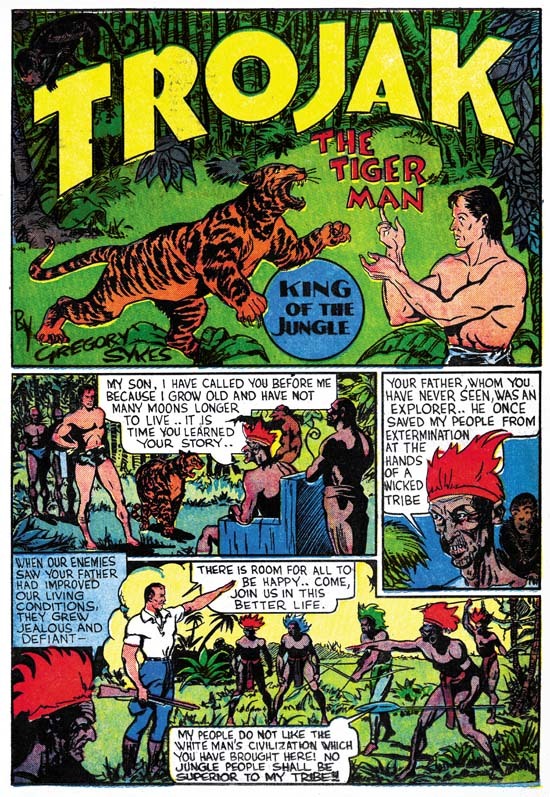 Another new feature for Daring Mystery #2 was a Tarzan clone called Trojak. This one is signed by Gregory Sykes. But don’t bother searching GCD or any other database for Sykes because you will not find any other trace of him. The way the “by” is written on the title panel, the similar ‘S’, the same style of page numbering, and the art style in Phantom Bullet and Trojak leaves no doubt that were both done by Joe Simon. Joe had so far shown a desire to promote himself, why not on Trojak as well? In all likelihood Joe was worried that Goodman would not want two stories by the same artist in one comic. I looked through the GCD listings for Daring Mystery in search for any other possible pseudonyms. I did find a couple of names that sounded suspicious; Maurice Gutwirth and George Kapitan. But further searching showed that they both actually were legitimate artists with a long record of comic book work. So Gregory Sykes seems a rare example of Simon using a pseudonym. Although stylistically similar to Phantom Bullet, the art in the Trojak story looks better. A lot of this has to do with all the action that was possible with Trojak and a jungle full of animals. The style is pretty uniform throughout the story except some of the natives look more developed. Sure enough, doesn’t the chief in panel 3 of the splash page look like the tree man from Solar Patrol? I wonder what the original source looked like? 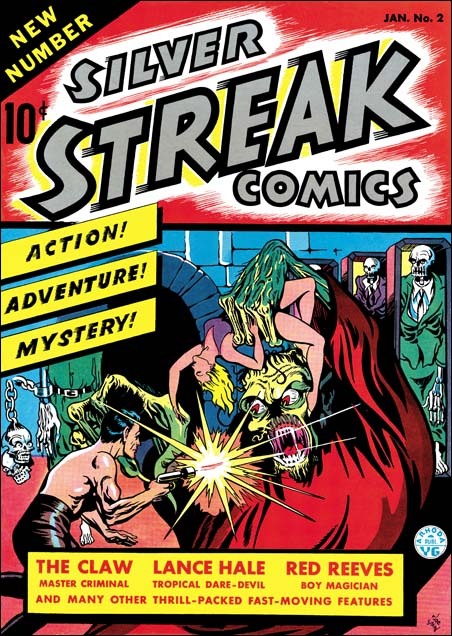 The GCD does list Joe Simon as the artists for Trojak in Daring Mystery #3 (April 1940), #4 (May) and #5 (June). The date for #3 seems reasonable, those for #4 and #5 less so, but still possible. 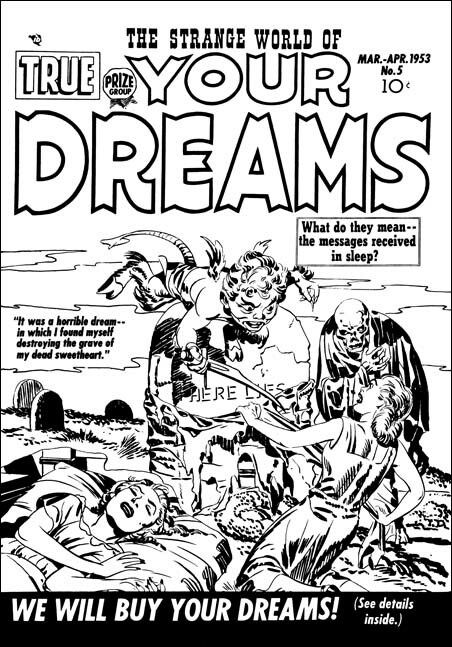 Daring Mystery #6 (September) includes art by Jack Kirby and so postdates this chapter. As mentioned previously the T-Men in this issue starts by wrapping up the story line from the previous issue. Although handled much too quickly, the way the villain gets his just desserts is really quite funny. Hopefully someday this story will be reprinted. The art for the wrap up is a good match for what was done in the Target #1. However the rest of the story is done in a style that closely matches the stories in Daring Mystery #2 from the previous month. 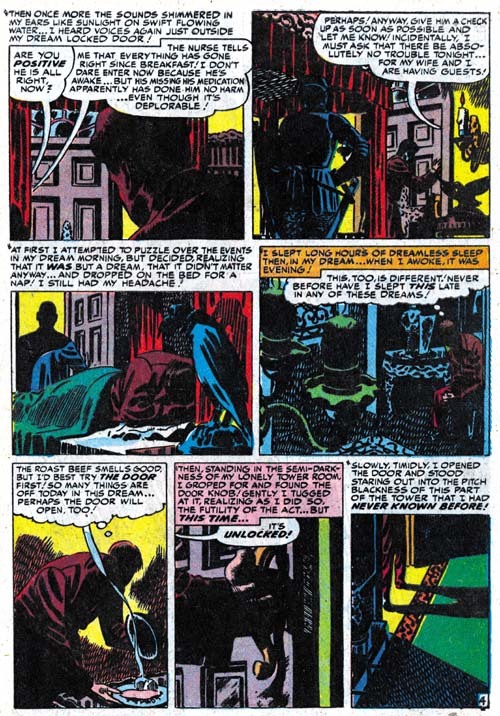 Joe uses larger page number in a circular field, exactly the same as in Daring Mystery #2. Further evidence that the publication of the work Joe did for Target was delayed a month compared to other titles. 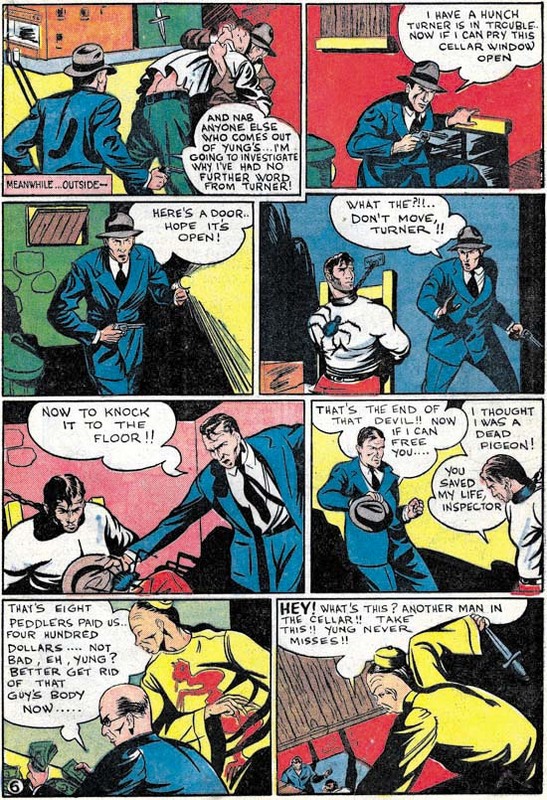 The GCD lists Joe Simon as doing the T-Men feature in Target #3 (April 1940) but that one is signed Ben Thompson and was done in a different style. Ben Thompson has a history of doing comics at this time so I do not think it is a pseudonym. 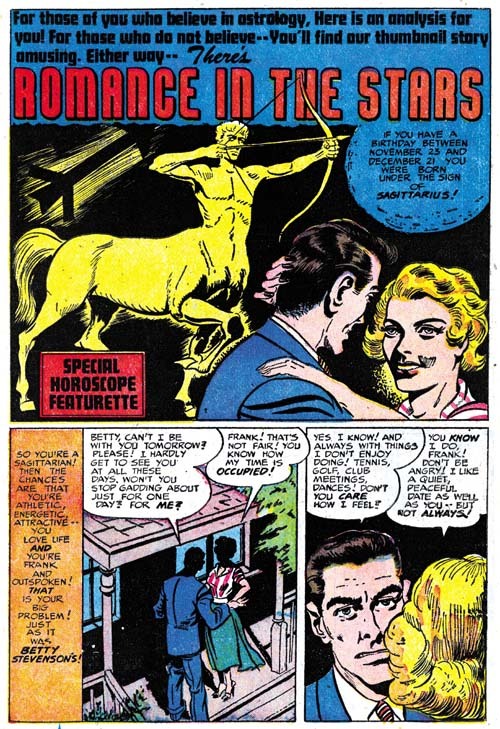 The GCD also list Simon as the artist for T-Men in Target #4 (May 1940). However I have not seen that issue. The first issue of the Human Torch was number 2 because Timely took over the numbering from Red Raven. With the high prices of key golden age comics, like the Human Torch #2, we are fortunate that Marvel has reprinted it recently. 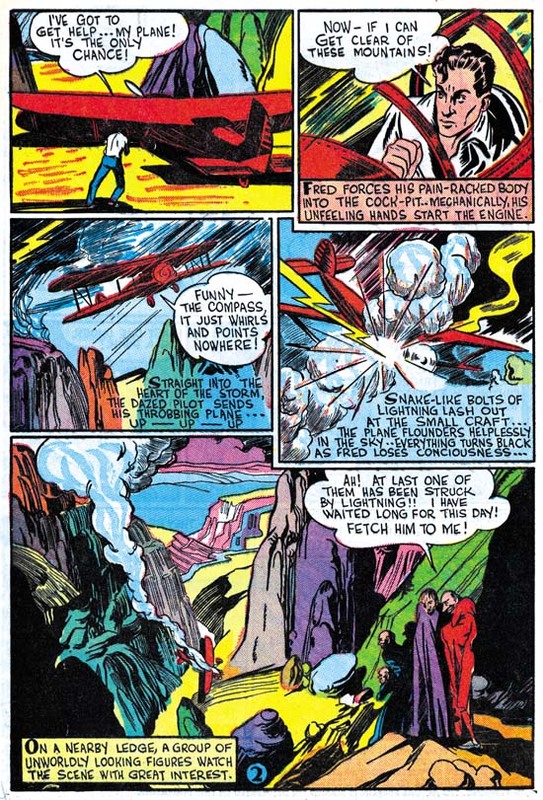 Red Raven #1 is cover dated September 1940, so the Human Torch #2 clearly comes after Joe and Jack met. But the Fiery Mask story in this issue was done by Joe Simon alone in a style similar to that he used before meeting Jack. This story is included here because I suspect that it might have been done earlier then its publication date would indicate. 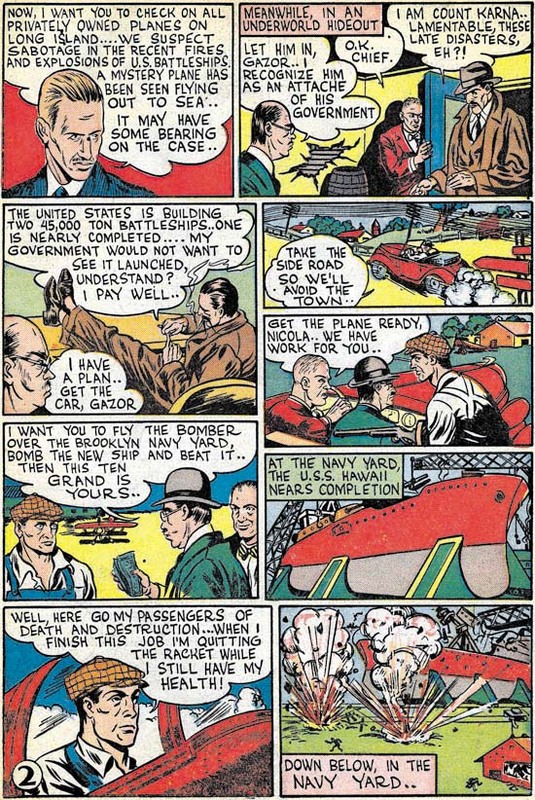 For those of you that have Greg Theakston’s “The Complete Jack Kirby, 1917-1940” compare the panel by Hal Foster of a man hollering with the one in the left corner of panel 3. Once more it appears that Joe is swiping from the same source material more then once. In these first two chapters we saw Joe Simon adopt his own style. Yes there are variations due to Joe developing his skill, and there are also differences due to Joe’s swiping. But careful examination for Joe’s style can provide attributions even when the work is not signed. I could say that armed with this knowledge we are now prepared to identify all of Simon’s early work. I could say that, but it would not be true. In our next chapter we will see Joe adopt an entirely different style. I disagree with the Kirby Checklist (and most scholars and experts as well) about attribution of some of the work to Jack Kirby. In most of these particular cases I believe the correct assignment would be to Joe Simon. Some of these examples look so obviously Simon to me, that I am amazed at that others cannot see it. In most cases I get no explanation as to why someone attributes something to Jack and not to Joe. As I have discussed previously, comic experts are unwilling or unable to explain their verdicts. There are some few scholars that have tried to give evidence to support their position. 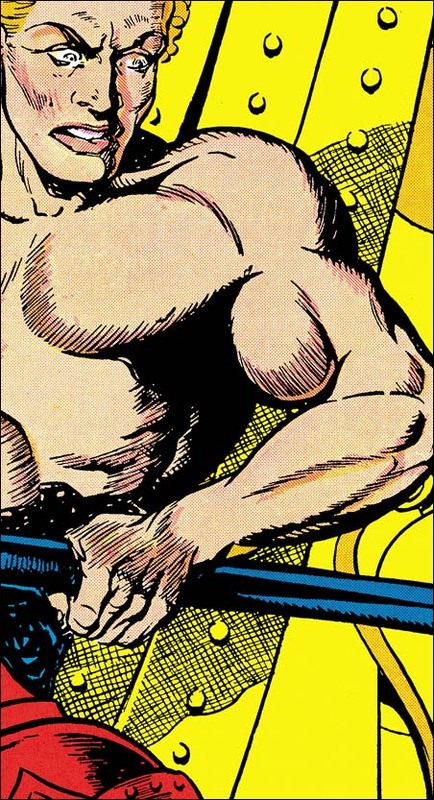 But in those cases what I keep hearing is that certain features look like their were done by Kirby. That is all well and good, but what I don’t hear are mentions of features that do not look like the way Simon would do them. In other words these scholars seem to be looking for evidence of Kirby involvement, but are not looking for clues to Simon’s presence. 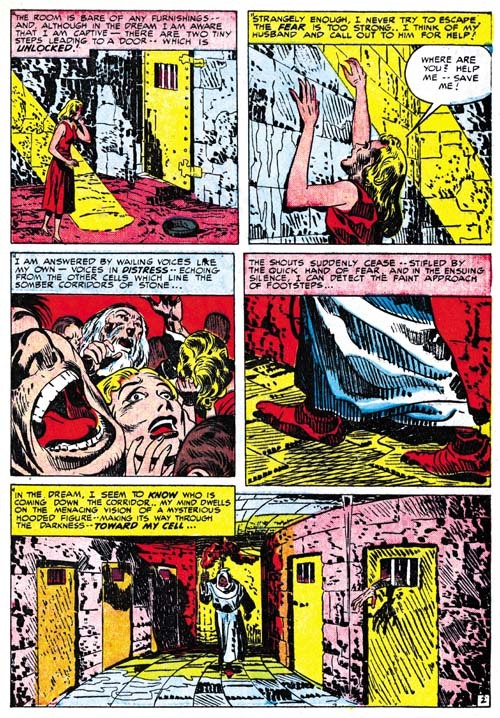 But Joe was a talented artist and through his inking of Kirby’s pencils was very familiar with his style. Joe had the ability and incentive to use things he learned from Jack and even at times to ghost Kirby. So I would like to do another serial post, this time on art done by Joe Simon before and during the Simon and Kirby collaboration. I doubt I will change many minds about some of these (in my view) misattributions. However I do hope to bring to some a better understanding of Simon’s own style. A similar attempt on the work of Jack Kirby would be a monumental undertaking, there is just so much of it. Joe did not do that much penciling during the years of the S&K studio. So you would think that it would not be that hard to do a fairly detailed and complete analysis. But with Simon I am faced with two problems. 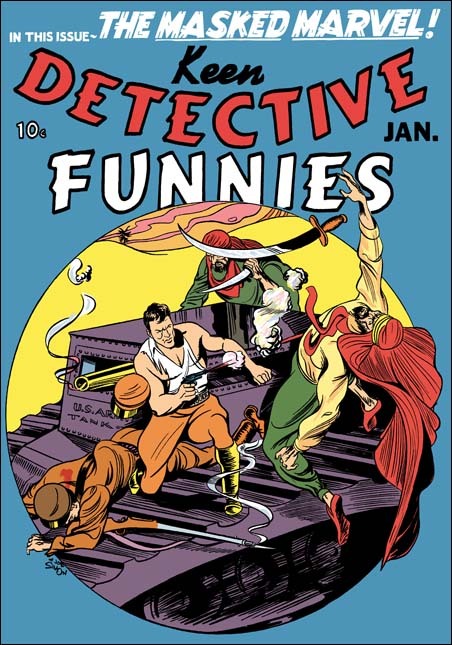 The first is that early work by Joe was done during the golden age of comics. These comics are uncommon and generally priced very high. I simply do not have access to all of the comics that some say have work by Joe in them. What I do have for study seems to provide a good idea of Joe’s techniques. A more complete access would certainly be desirable, but I do not think it will change much the view point that I will be presenting here. The second, more serious problem, is the lack of signed work during the period of S&K collaboration. Once they teamed up, work that was signed was done so jointly as Simon and Kirby. No individually signed art was done by either Joe or Jack. So we must look elsewhere for documentation of work by Joe to form the foundation of our analysis. Joe Simon started his career as a newspaper artist in Rochester, NY. The work I have seen are sport illustrations. These are nicely done in a realistic style, not at all like comic book art. Simon also did a lot of touch up work using an air brush. As Joe described it to me once, if an editor felt a dress was too short in a photograph of a woman, an artist would air brush it longer. Joe became a master of the use of an air brush. But the newspaper Simon worked for shutdown, and he decided to try his luck in New York City. Joe did find work doing re-touching. But although he was good at it, it was a career he did not want to remain in. Following a suggestion, Joe tried the new comic book industry and entered the Funnies Inc. shop. Although this was a completely new experience for him, he adapted quickly and found it to his liking. In his book “The Comic Book Makers”, Joe says his first job was a seven page western. Unfortunately to my knowledge nobody has located what comic this western was published in. The first published work we do know about was done for different publishers, Lev Gleason, Centaur and Timely, and have cover dates of January 1940. Two covers and two stories, for someone who never did comics before it was an impressive start. But comics was a new industry with opportunities for the those with ambition and talent. For the Keen Detective cover Joe Simon has chosen a fight atop an American tank in the Arabian desert. An unusual choice since the middle east was not then the center of conflict it is today. Here Joe has trouble depicting the hero. His left arm is not convincing, nor is his left leg. Otherwise the rest of the figures are handled well. Simon’s composition works well with and complements the circular field used. The circular field works so well that I wish I could credit Joe with it. In fact this field was a trade mark of Keen Detective and was used for a number of covers before this one. However most of the artists were unable to use it as effectively as Simon did. Still I believe Joe liked the results and a circular design would reappear in some S&K covers in a couple of years. The inking looks like it was done mainly with brush. To me there really is nothing wrong with the inking. But it seems mainly to be used in deliminating the figures. What spotting there is appears mainly to have been done to provide some form to the tank, it is does not seem to aid the over all design. For the cover of Silver Streak #2, Joe depicts the Claw, a villain with his own feature story inside. 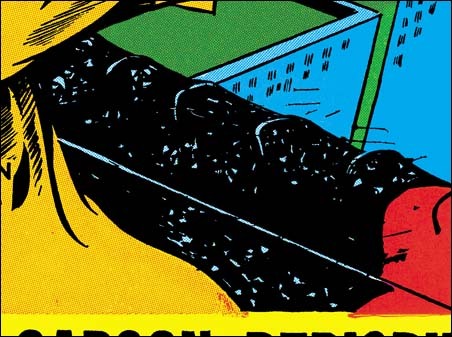 Although given a monstrous portrayal, the Claw was originally recognizably as a personification of the yellow peril. Being politically correct was not a consideration in those days before the war. But Simon has made the Claw not as an Asian monster, but instead used Frankenstein as a model. It is an exciting cover with corpses in open coffins (zombies? ), a scantly dressed damsel in distress and a hero to the rescue. Remember the damsel, we shall see her again. Anatomy is not Joe’s strong point here, he does not even try to be accurate. Simon provides enough muscle lines to convince the viewer that the hero is strong in body as well as strong in character. What Simon does excel at is design, and the composition of the cover is excellent. Inking is done primarily with a brush in a bold manner. The inking is much more effective then in the previous cover. Joe Simon initiates a new feature, Solar Patrol. Joe liked science fiction, and it was a genre that he would turn to often. Frankly after Joe’s exciting cover work, this example of his story art is a bit of a let down. You can tell he is uncomfortable with the whole aspect of the sequential art. Simon does not seem to be satisfied with a standard panel grid and uses variously sized panels instead. Unfortunately it becomes a bit confusing and Joe sometimes had to add arrows to indicate the proper reading sequence. I suspect his panel layout was an attempt to make it all more interesting. He does not succeed here, but I think it is the forerunner of the irregularly shaped and circular panels that S&K would use in the future. In this story Joe seems to have followed the use of simplicity to a fault. Perhaps because of it he does not seem to be able to make panels as exciting as his covers. Even panels that by their nature should be interesting, such as the space ship destroying the enemy base, come off as rather dull. Another aspect of Joe’s adoption of simplicity is techniques he starts using in the depiction of his figures. Most obvious among them is the way Simon draws eyes. For men viewed at mid-distance Joe uses a single mark to indicate the eye itself and another for the eyebrow. He joins these two marks so that they meet at an angle, sort of like a sideways ‘V’. 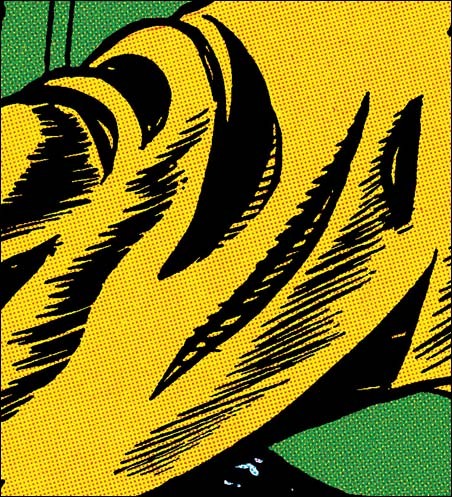 We will see this typical Simon technique in much of the art he did before teaming up with Jack Kirby. As for women, Simon economical penciling is too extreme leaving them with limited hair strand lines and no real feel of curls. There is a striking difference between how Joe draws the humans, and the more detailed version he provides for the tree men. I suspect that Joe may be swiping the aliens from some unknown source. Even if that is not true, we will meet a related version of the tree men again. 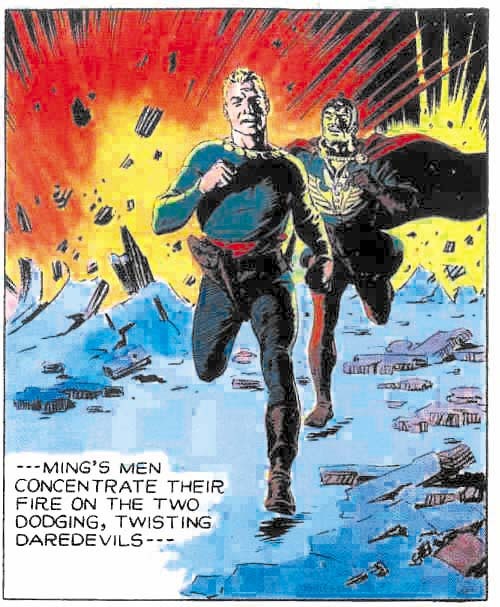 For another story, Simon was asked to make a character based on the use of fire such as done in the Human Torch. This might sound like a recipe for infringement except the publisher was Goodman, he already had the copyrights to the Human Torch. 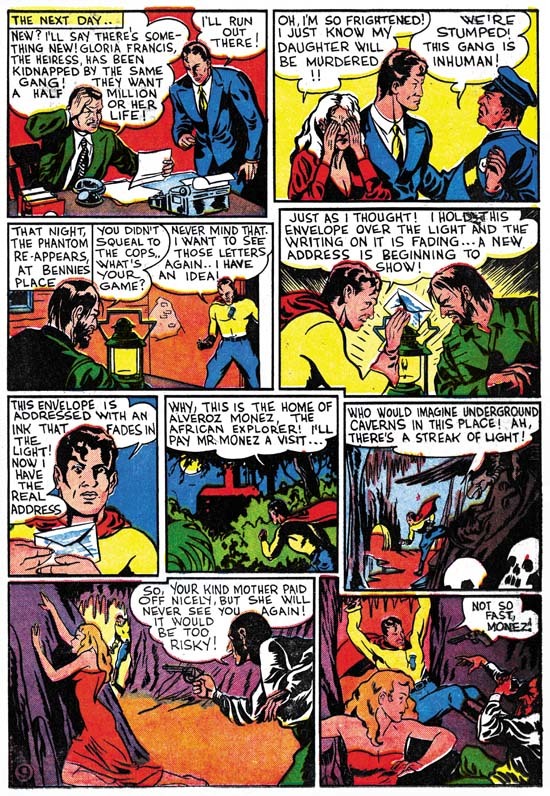 Joe’s response was the creation of the Fiery Mask which appeared in Daring Comics #1. Unfortunately I have no scans for this story. But if you are a Kirby diehard, you may have a copy of Greg Theakston’s “The Complete Jack Kirby, 1917 – 1940” which has a wonderful restoration of this story. Joe did a much better job with this feature then he did on Solar Patrol. Part of the reason is due to the his adding more action and interest to his panels. Greg Theakston gives another important reason by showing that Joe has done a bit of swiping from master artist Hal Foster. Let me close this chapter with a story Simon told after dinner to Carmine Infantino, and myself. 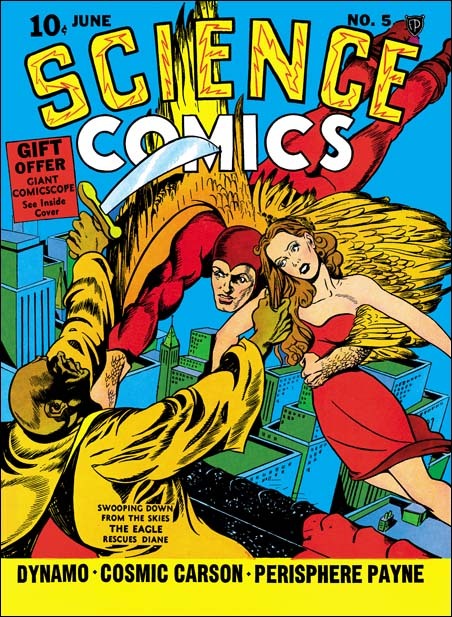 Joe talked about the cover to Red Raven #1 (August 1940). Apparently someone has recently shown that the drawing is a swipe (from Hal Foster again?). Joe grumbled that when it when it was thought to be an original work it was a Kirby, but when now that it is a swipe Simon must have done it. But after he finished this remark Carmine asked “But Joe did you use swipes?”. Joe replied “Of course I used swipes, everyone did”. (Actually the Red Raven cover was penciled by Jack, but I suspect the layout was by Joe, and not because it is a swipe). We will find that not only did Joe use swipes, he re-used them. Posted June 9, 2006 in 2006/06, 4 DC (early), Harvey Covers, Periods, Topic, z Archive. While I worked on the End Of Simon & Kirby serial post I put on hold my posting on the S&K Harvey covers. But now it is time to resume that effort. I say effort not because of the writing, but the restoration of the images. These Harvey comics are not common and frequently in poor shape. But all these covers are gems and well worth the work. The bailing Liberty Lab is not in exaggerated perspective, but still seems to have the Kirby touch. So I believe Jack was the primary penciler. An end to unauthorized copy taken from this blog. Posted June 8, 2006 in 2006/06, Uncategorized, z Archive. I received an email from the owners of web page that had made an unauthorized copy of the Furnished Room image in my Bill Draut post. I fully accept their explanation that this was due to over enthusiasm and not to a deliberate attempt to ignore my copyrights. They have removed the image in question from the Draut biography. I therefore have deleted my post complaining about this use. I see no use for it remaining now that this issue has been resolved. 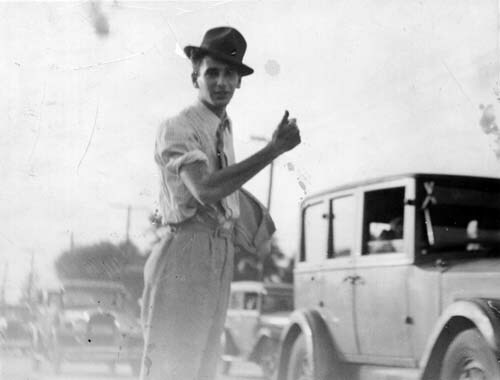 As for the posts with Joe Simon images that I removed, I do plan to restore them. But I am busy getting ready for my next post (a real dream) so I will not get to it until this weekend.